Layana Resort & Spa is an exclusive boutique resort facing a fine white sandy beach and set against a picturesque backdrop of forested hills. Laid out amid tropical gardens and designed to harmonize perfectly with its natural surroundings, the resort comprises low-rise, contemporary Thai-stysle buildings that combine spaciousness with an open, cool and natural ambience. Here guests have the opportunity to appreciate an idyllic island world far form the pressures of the city. As an exclusive haven of luxury, Layana Resort & Spa aims to offer the ultimate in individualized service. Throughout, guests appreciate Thai hospitality that is unobtrusive to preserve privacy, and yet attentive to give a sense of privilege and to fulfill every wish. The resort features 50 luxurious geustrooms and suites, comprising 44 Garden Pavilions, 3 Beach Suites and 3 Ocean Deluxe Suites. All are designed in contemporary Thai style, complete with balconies commanding sea and mountain views, while decor and furnishings are both natural and luxurious, making sextensive use of hardwoods, silkds and other indigenous materials. Garden Pavilions room, offering 49 square meters of living space, are located in 11 two-storey units, each with four guestrooms, nestled with landscaped gardens. Beach Suites, with 59 square meters, are single-storeyed units perched on the edge of the beach. Ocean Deluxe Suites, directly overlooking the beach, cover 88 square meters laid out over two storeys, with an upstairs living room and open-air area commanding 270-degree views. All rooms have king-size with goose-down duvets, as well as a large day bed serving both as a daytime sitting area and as a third bed at night. Bathrooms are fitted with bathtubs and separate showers, while the suites are additionally provided with open-air garden showers. 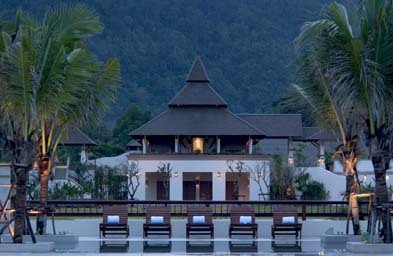 ###Spa Experience Secluded within its own walled garden, the resort's Linger Longer SPa is a sancturary from stress. Here guests rediscover their inner harmony through an extensive range of Eastern and Western health and beauty treatments designed to promote physical, mental and emotional well-being. All therapists are fully trained and products used are from natural products. French imported products are used for facials. #Restaurants and Bars ##Tides This is a format restaurant serving an a la carte selection of international dishes, as well as Asian fusion and seafood specialties. Menu quality is fully matched by the execellence of the wine list, Guests have the choice of a cool interior venue or an alfresco beachside setting. ##Sundowners Facing the ebach, this is the perfect location for cool drinks and evening cocktails. ##Library Provided with books, magazines, newspapers and Internet access, the Librayr serves coffee, juices, ice creams and freshly baked pastries and cakes. #Location Layana Resort & Spa is located on the west coast of Koh Lanta Yai at Phra-Ae Beach (Long Beach), a 3-km stretch of white sand. Lying off the coast of Krabi Province on the Andaman Sea shores of southern Thailand, Koh Lanta Yai is approximately 27 kms long and 12 kms wide, making it the largest of 15 islands in an archipelago that forms the Koh Lanta National Marine Park. #Access Layana Resort & Spa can arrange surface transportation to and from any point in Phuket, Phangna and Trang provinces. Arrivals at Krabi Ariport will be wolecomed by our representatives and transferred to the resort via a 20-minute drive to Laem Kruat pier, and then a 40-45 minute ride along the coast of Koh Lanta Yai on Layana's private speedboat. Guests arriving by their own car can reach Koh Lanta Yai via two ferry crossings, the first from the mainland at Ban Hua Hin to Koh Lanta Noi, the second from Koh Lanta Noin to Ban Ssala Dan on Koh Lanta Yai. With sunning and remote islands, spectacular shallow corals, tropcial coastal rainforest, and ancient and diverse cultures, Koh Lanta offers so much more than a simple beach holiday. In addition to the scenic beauty of the various islands that comprise Koh Lanta National Marine Park, places of interest include Mai Kaew Caves, a fascinating complex of caverns with a forest setting in the center of Koh Lanta Yai. For the scuba enthusiasts, there is a wide choise of excellent dive sites, especially around the uninhabited islands of Koh Rok No and Koh Rok Yai. There are also opportunities for snorkeling and sea kayaking, while among active options on land are elephant treks and nature hikes. Tours and excursions covering all places of interest, as well as sports activities, can be readily arranged by Layana Resort & Spa.